It is one thing to know high probability areas for finding placer gold near a stream. It is quite another thing to locate property that is a good contender for holding gold. 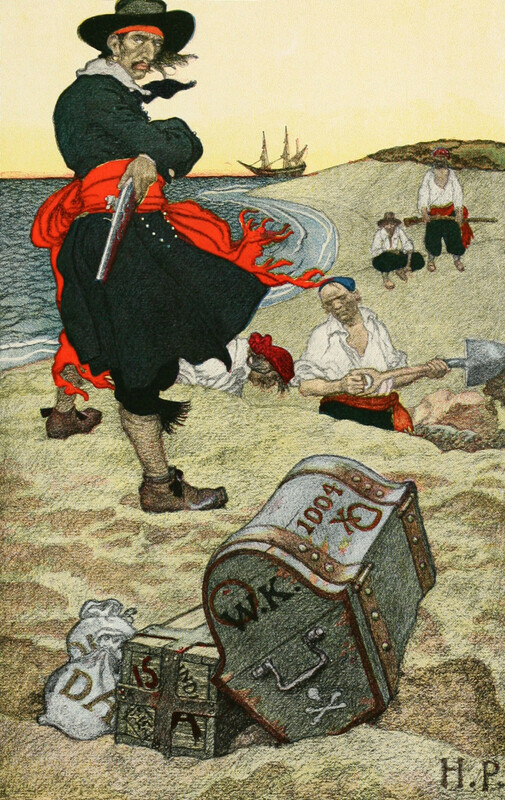 Finding a property that might contain gold is the subject of this article. And, just as there are places to look on a claim where the nature of placer gold is likely to dictate where it "falls out" or settles, there are some fundamental rules for selecting an unclaimed area. Finding gold this way is much harder than searching on a claim (where gold has already been found), but the rewards can be huge. One of the first things to look at is geology. Since most areas containing placer gold are downstream from a lode (a hard rock source), you probably will want to look somewhere not far from mountains. If there is a range where some gold has previously been found, that is even better. As rain and melted snow run over rock formations, bits of gold break loose, and these flakes wash downstream. 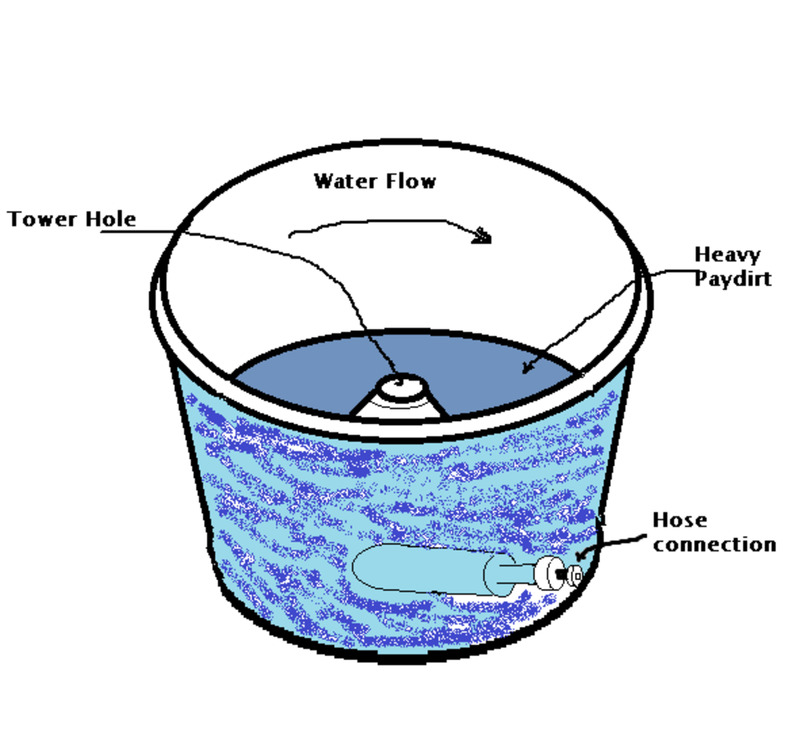 Since gold is very heavy (19 times heavier than water), the force of the water determines where the gold settles. As the force decreases, flake starts to fall out. The larger flakes fall out first. 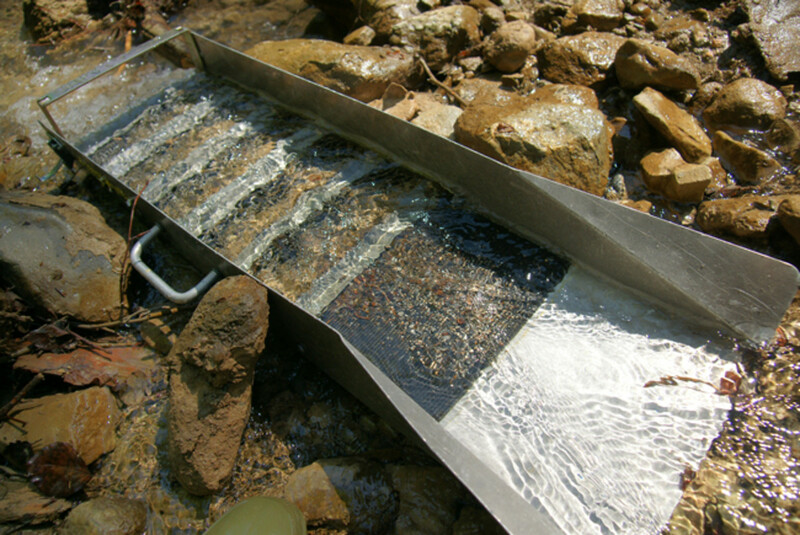 The lighter flakes continue to be carried downstream until the water slows sufficiently for the gold to settle to the bottom of the waterway. So, one of the first things to look for is a piedmont. A piedmont is a foothill region. 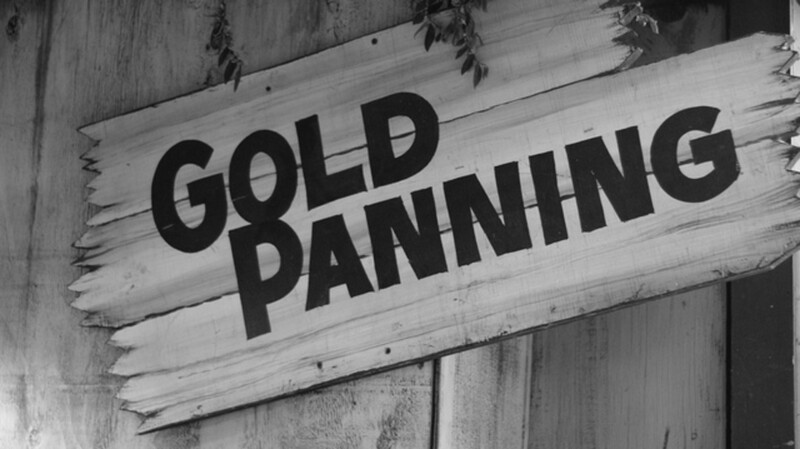 In gold prospecting, the term designates an area leading away from a mountain to its base. It is created by material washing out of the mountains. This material deposits itself in a distinct pattern. Heavier material is at the top. Then follow heavier pebbles (where gold nuggets can be found), then smaller pebbles and gold flake. The original word from its classical roots means "at the foot of the mountain". Another term for this type of region is an alluvial deposit. You more than likely have seen them in the past. If there is a lode (hard mine deposit) above, there will be placer below. In reality, most areas downstream from a discovered load have been claimed. But if you discover placer gold in an area containing a virgin gold lode, you will find placer flakes. Remember, gold outcroppings occur in multiple fingers. Where there is one, there may be many close by. 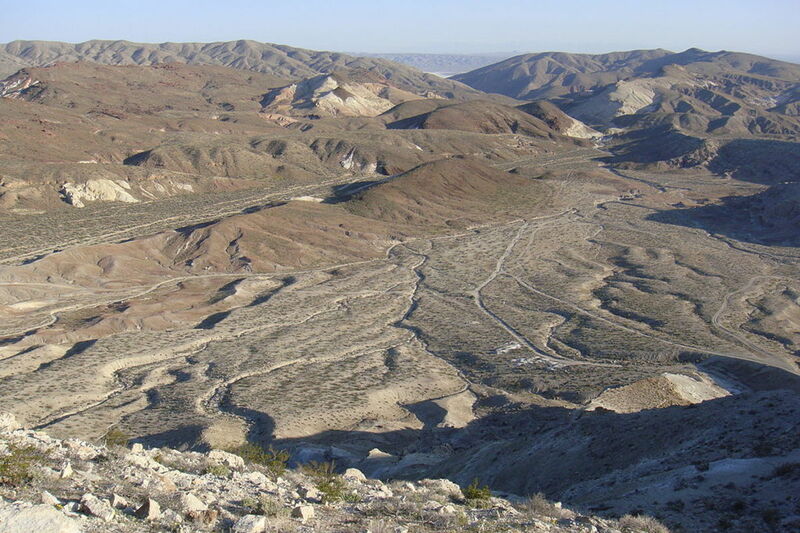 The next thing you might want to do is to hike up the mountain side and see if you cannot find the lode. Of course, there could be an out cropping of quartz with gold, or you may have mineral deposits that contain gold. Either way, exploring could be worth your while. While highly improbable, experts know that all of the gold on earth has not been discovered. 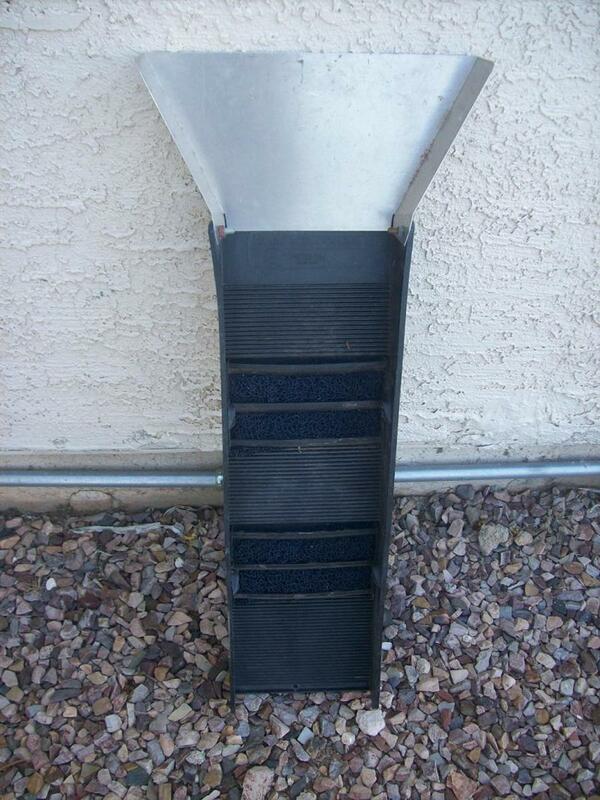 Placer flake is the focus of this article. Next, you might want to look for benches. Benches are hard rock cuttings formed by water running swiftly over a combination of hard and soft rock. It might take thousands of years to cut through hard rock, but if the swift water finds a layer of soft rock, the water will cut through it relatively quicker than the hard. Suppose you have a granite-hardness type rock that suddenly becomes limestone? The limestone portion will be cut faster. As the water level drops down the cutting side, the hard rock (granite) is left behind. This gives a rock formation on a canyon wall that resembles a bench; yes, something you could sit on. These “gold benches” can have cracks and residue on the seat and back of the bench. By vacuuming and prying open cracks, gold that has previously gotten stuck can be sucked out. Material on the seat of the bench can be collected and panned. Many a prospector has discovered gold in this manner. I frequently use a whisk broom. Gold can be found as very small particles in rock. Also, in particular, a by-product of copper mining, gold is recovered from the extraction process along with other valuable metals. It is often said that the gold, silver, and platinum content, a result of the copper ore processing, provides mining companies with enough money for their whole operation - copper is frequently referred to as pure profit. 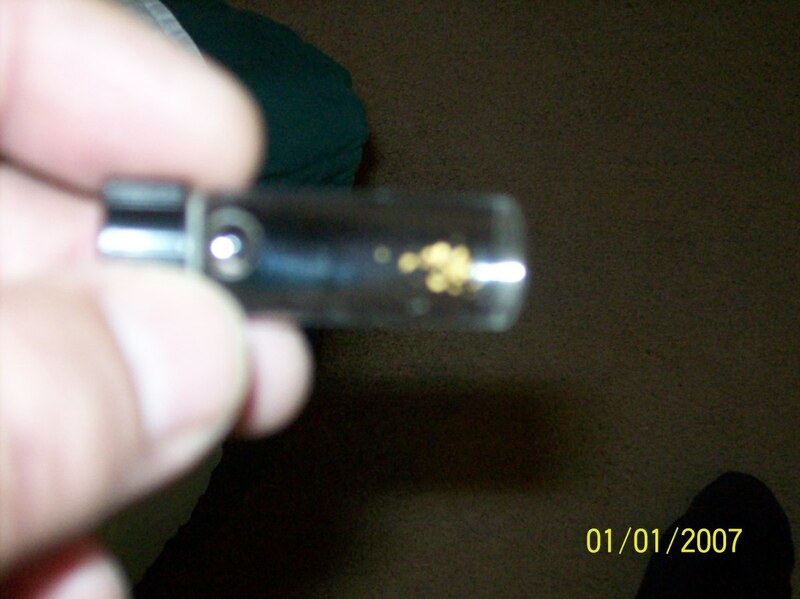 Gold is often mixed in sulfide minerals. In addition, Fool’s Gold (pyrite) can contain gold. Quartz can often be mingled with veins or nugget size pieces of gold. One of the most famous and oft sought signs of the possibility of gold is the sight of white quartz. This purer/richer form, perhaps more exciting, is found in veins. At the surface of these veins, the deposits tend to be richer. So, investigate the white quartz with a close eye; it is important. Another thing to look out for is ancient waterways. As you may well know, water can travel along a course for many years, and then for some reason, it will divert. Perhaps large boulders fall into a stream or river bed and direct the water to the side. A new water passage is created. If this area is descending, the water may move down for even more distance until it begins to take its new course. Looking for old waterways (now dry) is based on geology. 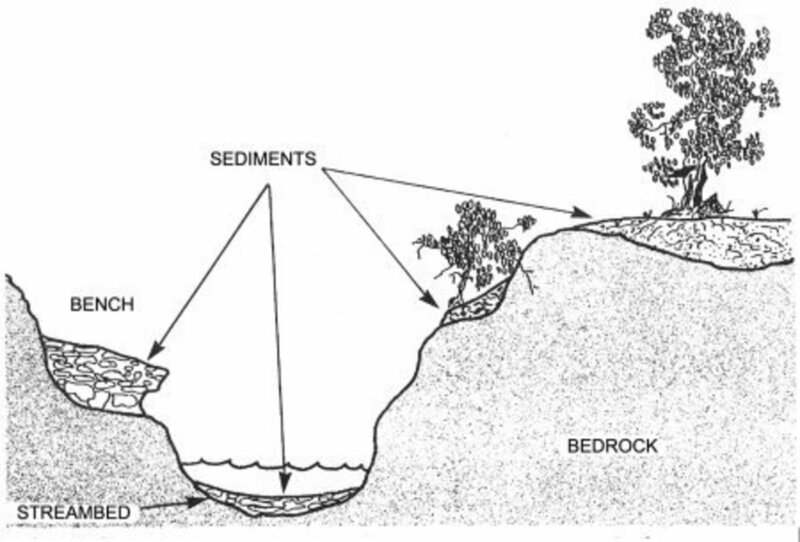 If you look at the top of a waterway and see to the sides layers of rock and pebbles, that means that the current waterway diverted from that. That area to the side is a good spot to prospect for placer and nuggets. And now, a word about gold ore. Brown is often the color of gold. It can be iron-stained rock or huge white quartz deposits. Gold ore usually contains only small traces of gold. 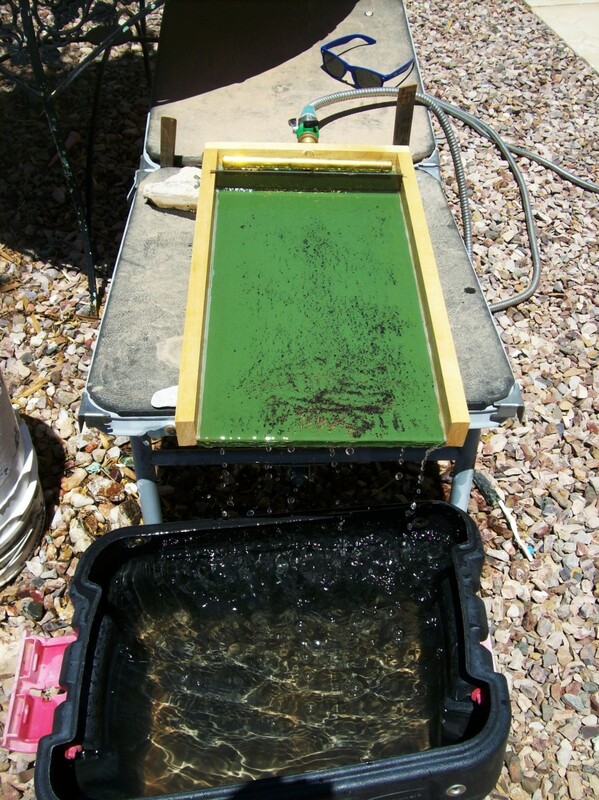 You extract the gold by crushing the ore to practically powder size, and then the gold is separated by panning or some large mechanized version of panning that allows for the processing of more material (shaking tables, etc.). While discovering a virgin lode gets harder and harder (if not nearly impossible), quartz bearing gold can still be found at old lode sites. You must be a fortunate prospector, but it happens. Remember, commercial operations end when it is no longer profitable. That does not mean when the gold is exhausted. 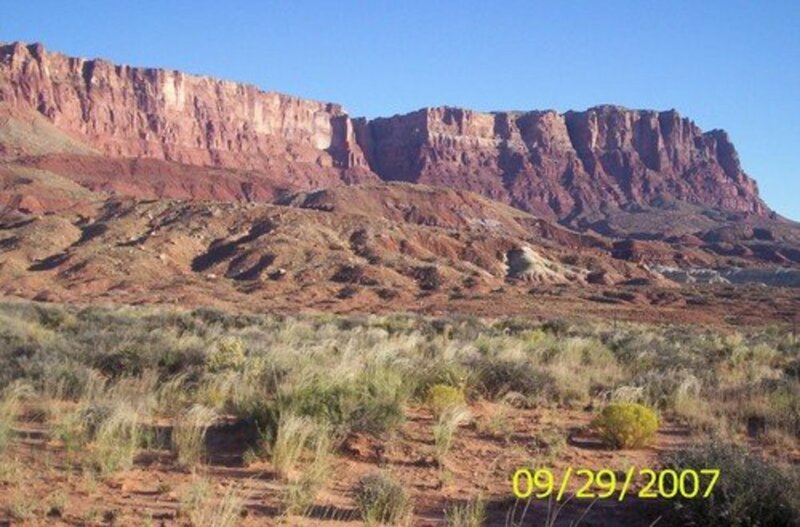 Investigate areas near the site of former gold quartz ledges. 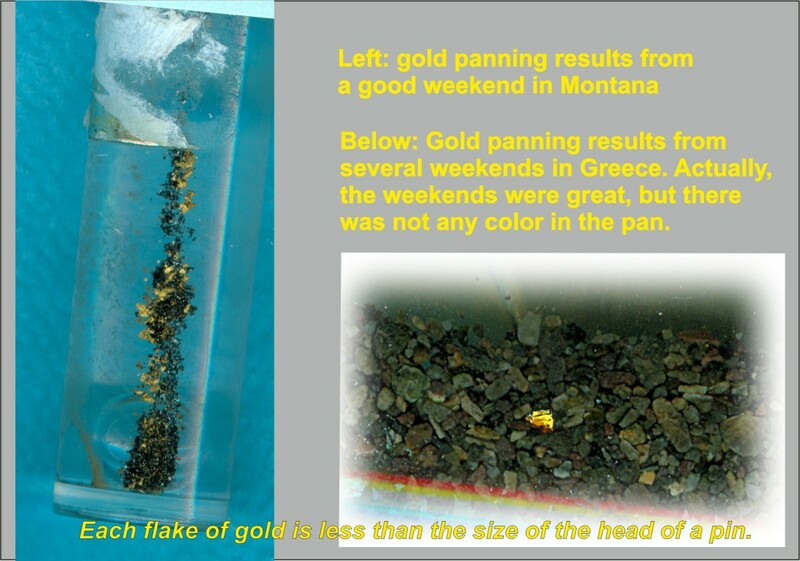 Finding new areas of placer gold that have not been claimed is in my opinion “easier”. Fine gold flake can be found for many miles on waterways and their tributaries. Looking at satellite photos of earth’s surface in the proximity of already- discovered gold country is very useful also for detecting prime gold bearing candidates. What's your favorite gold separating apparatus? I have seen some of the caches found in England that have Anglo-Saxon and Roman jewelry and other bits of gold. That's metal detecting - some of the stuff found is extraordinary. Thanks for the comment.